NEWS: Austria threatens legal action over Germany’s ‘foreigner vignette’. Gumball is a huge hit in Barcelona. Poland takes to taking away driving licences. The Bulgaria-Georgia ferry re-opens in August. Speeding fines are remarkably cheap in Austria, plus new border bookings in Belarus. Potential delays today due to go-slow taxi protests in major cities around France – columns seen at Orly Airport south Paris and on A86 ring, A6, A4 and A1, and in and around Lyon and Marseilles – and in Germany – Berlin, Hamburg and Cologne – and Italy – Milan, Rome. No general major disruption yet though the Frejus Tunnel, France-Italy, closed due to taxi protests – now re-opened – with drivers advised to divert to Mont Blanc. It also turns out that the hours long blockage of the A9 at Perpignan was due to picketing taxi drivers. Low level go-slows are being reported all over France. GIBRALTAR QUEUE WATCH: after a relatively quiet few weeks delays were estimated at a recent-record five hours at lunchtime today before subsiding. Austria lifted an exemption for its own vignette on a short stretch of the A12 Inntalautobahn last year in a move the irked many German drivers. Austria is threatening to take Germany to the European Court of Justice over its plans for a foreigner vignette. Such a move has been rumoured for a while but this is the first time the threat has been made public. At the least, legal action might delay the introduction of the vignette, currently slated for 1 January 2016. Austria shares a 784km border with Germany, ironically with Bavaria where the ‘foreigner vignette’ idea originated. 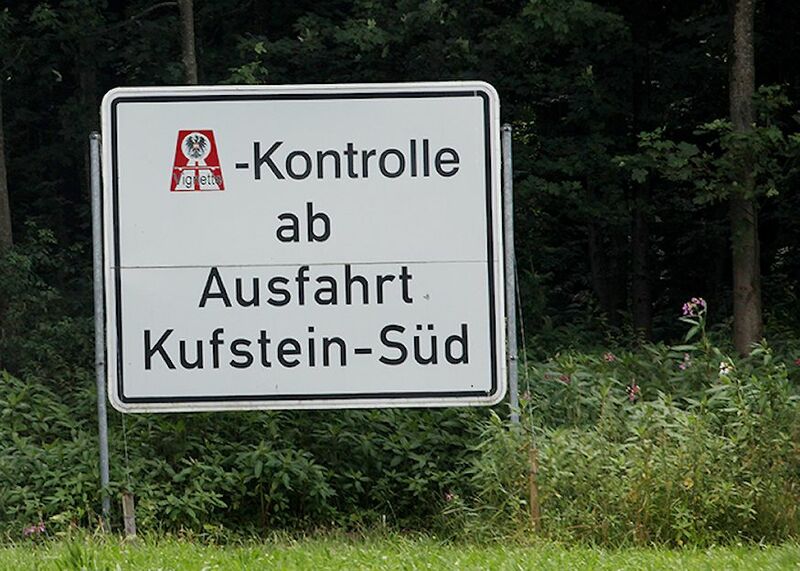 Bavarian drivers blockaded the A12 Inntalautobahn late last year after it was announced the exemption from the Austrian vignette for the short stretch across the border near Kufstein had been abolished. Austria charges all drivers, domestic and foreign, up to €82.70 per year to use its motorways. In a TV interview on Saturday, Alexander Dobrindt dropped more hints about his plans. He said €100 per year sounded like an ‘interesting number’ and that low emitting cars – so called Okoklassen – would receive a discount. It is not clear yet if foreign Okoklassen cars will also qualify for the lower price. roundup: POLAND. Confiscating driving licences is increasingly the punishment of choice for severe traffic offences says TISPOL. More than 900 have been taken away so far this year compared to 727 in the whole of 2012 and 768 in 2013. Likely in cases of 50kmh+ over the limit. The absolute maximum fine is €250. The BULGARIA-GEORGIA ferry will be restored in August, running from Burgas, for passengers and freight. The ship has been acquired and is due to arrive next week. Owned and operated by Clever Synergies Investment Fund. More soon. Meanwhile, 69% of all registered vehicles in Bulgaria are over 16 years old; 70% of all heavy accidents involve vehicles older than 10 years say new figures. AUSTRIA. ‘Just got cheapest ever fast driving award. €25 in Austria on condition it was paid on the spot and in cash. Hope it buys something nice,’ says motoring writer Andrew Frankel (@Andrew_Frankel). BELARUS. e-reservations for border controls will be introduced at the Kozlovichi (Kazlovicy) checkpoint with Poland this year and Kamenny Log with Lithuania next year says Belta News Agency. More details on the Belarus State Customs Committee website.